Sometimes a book sits at the corner of your awareness but, for whatever reason it remains there, a title and author you have encountered, and even entered into that mental note space which contains those books you were meaning to read, until one day you finally open it up and think: What took me so long? 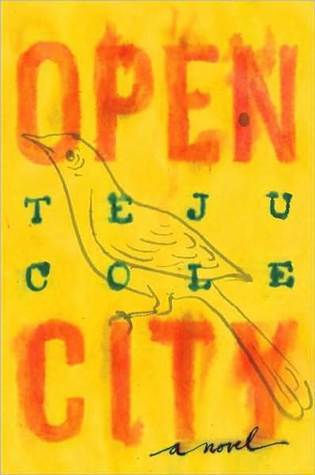 Admittedly, Teju Cole’s Open City, originally published in 2011, is hardly a dusty old tome, but its relevance in the post 9/11 world becomes more acute with each passing day. At the heart of this meditative novel is Julius, a young man of mixed German and Nigerian ancestry who is completing the final year of his psychiatric residency at a New York City hospital. A sensitive and fragile narrator with widely eclectic interests ranging from Mahler to art to a keen eye for urban bird life; Julius spends much of his time walking the streets of New York, and, for one wet winter month, Brussels. He encounters strangers, visits with friends, explores parks and alleys. He is propelled by what seems to be a restless discontent: he has recently broken up with his girlfriend, he has a curious compulsion to see if his German grandmother is still alive, and he carries unresolved baggage from his childhood in Nigeria. Yet, as he nears the end of his psychiatric training, the respect he believes he has for the souls of the patients he treats, does not guarantee that he has any clearer sense of his own than, well, any of us do. As much as Julius is an engaging, complex companion — at once insightful and shortsighted — it is Cole’s spare and evocative language that pulls the reader along on his journey. The frequent comparisons to WG Sebald are not without merit, both authors manage to create a hypnotic flow of reflective imagery rich with references to history, art, literature and film; but Open City speaks directly to the early 21st century, reframing questions of racial and ethnic identity, collective fear, violence, even mental illness, with a new and immediate relevance. I found myself wanting to linger in the pages, there are so many ideas packed into this slim volume. In the days following the tragic events in Paris in January, Teju Cole wrote a very measured and sensitive response in The New Yorker, attempting to balance an appropriate reaction to the Charlie Hebdo situation in light the extreme violence committed, historically and presently, around the world. His challenge echoed the conversation his two disillusioned Moroccan intellectuals have with Julius in Brussels. They express their frustration at not being able to talk about Palestine as Muslims without being branded anti-Israel, despairing that no middle ground for dialogue is possible in some situations. The advantage in fiction, is that you can give characters voices to express contradicting, difficult and controversial perspectives. Julius’ encounters with a wide range of people, together with his own musings and self discoveries, provide a framework within which Teju Cole has created a novel that is deep, rich and timely. At long last you have read something that I can pir…uh … *swats parrot off shoulder* download. I’ll read it when I’ve finished whatever I’m reading now, if indeed I am reading anything. Last night feels light years ago and my memory is shittier than usual. Hope the clinic goes ok mate … am thinking of you across prairies and oceans and deserts and mountains and so forth. It is a meditative, reflective work with a great narrator who has lots of his own baggage. You will enjoy some his reflections on psychiatry later on too. But the writing is awesome, cinematic, like watching a European film. Sleep well under those African skies. I’ve meant to read this for ages. But then that seems to be the story of my reading life. If I weren’t in the middle of so many other things right now I’d dive in. It is not a difficult read, but the writing is so wonderful and the ideas fascinating and layered that I wanted to savour the experience. Not too many books have that impact. Sounds like something up my alley too, though may not be able to get to it. A gorgeous review. I was taken by “They express their frustration at not being able to talk about Palestine as Muslims without being branded anti-Israel, despairing that no middle ground for dialogue is possible in some situations.” This is so true in our often polarised world. It’s good that fiction can navigate that space but we must get better at moving that into “real” discourse as well. Well do keep it in mind. I dare say this book is not going to disappear and the themes explored by Cole and his character are only likely to become more relevant in the current atmosphere of our post 9/11 world. Thanks for sharing this! Stunning images with Cole’s sensitive and brilliant reflections. Cool. I have this RSS feed on my browser but I forget to check it, I should set it up differently.